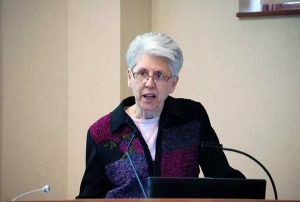 Sister Corinne Florek, OP, encourages shareholders to vote their proxies to transform the corporate culture. April 10, 2017, Adrian, Michigan – Shareholders in public corporations have a unique privilege, opportunity, and responsibility: to use their proxy ballots to shape the values and decisions of those corporations. 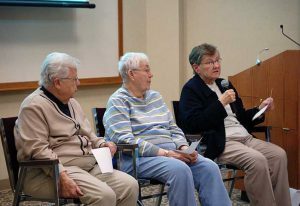 Sisters who spoke about their ministry of voting the Congregation’s proxies were, from left, Sisters Thérèse Haggerty, OP, Joan Marconi, OP, and Frances Lombaer, OP.